Dr. Madhombiro continues to shine!! 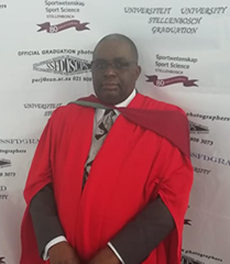 Dr Tariro Mawoza who is a lecturer in the Department of Clinical Pharmacology and a 1st cohort fellow for the PERFECT Programme at UZCHS graduated with a Doctor of Philosophy Degree in Medicine from the University of Zimbabwe in September 2017. She registered as a part-time PhD candidate in 2012 and her project was titled “Pharmacological evaluation of Sclerocarya birrea stem bark extract on vascular and extra-vascular smooth muscles”. This was a laboratory based study aimed at determining the effects that a plant, Sclerocarya birrea, has on different tissues in relation to contraction or relaxation effects, plant toxicity and in vitro effects on hypertension..
Dr James January who is a Chairperson and lecturer in the Department of Community Medicine and a 1st cohort trainee graduated with a Doctor of Philosophy Degree in Psychiatry from the Nelson Mandela School of Clinical Medicine, College of Health Sciences, University of Kwazulu Natal (South Africa) in June 2018. He registered as a part-time PhD candidate in 2016. His project was titled, “Postnatal depression among women attending postnatal services in two rural districts of Chipinge and Mutasa Districts, Manicaland Province, Zimbabwe.” The study assessed the criterion validity of the PHQ-9, EPDS and CES-D depression screening tools against the DSM-5 as the gold standard among women attending postnatal care in two rural districts in Zimbabwe. From the study, the pooled prevalence of postnatal depression in the two districts was 25%. The study showed that the three depression screening tools may be useful in screening women for depressive symptoms in postnatal care in Zimbabwe. He urged other PERFECT trainees to pursue PhDs to enhance their research skills. 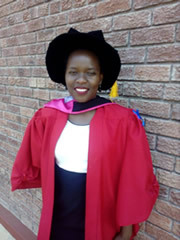 Dr Tariro Mawoza who is a lecturer in the Department of Clinical Pharmacology and a 1st cohort fellow for the PERFECT Programme at UZCHS graduated with a Doctor of Philosophy Degree in Medicine from the University of Zimbabwe in September 2017. She registered as a part-time PhD candidate in 2012 and her project was titled “Pharmacological evaluation of Sclerocarya birrea stem bark extract on vascular and extra-vascular smooth muscles”. This was a laboratory based study aimed at determining the effects that a plant, Sclerocarya birrea, has on different tissues in relation to contraction or relaxation effects, plant toxicity and in vitro effects on hypertension. Graduating with a PhD in Medicine was a great achievement for the Mawoza family and herself. Reflecting on how the family felt when she graduated, she said, “The graduation was such an exciting event for everyone especially my family, as I am the first Mawoza to obtain such a prestigious achievement. The degree took a long time complete; I waited for it for good five years”. During five years of study, she also learnt very important things such as: time management, using new laboratory software and being confident as a researcher. She is also grateful for the funding she received from the Southern Africa Consortium for Research Excellence (SACORE) through the WELLCOME Trust as this enabled her to conduct my PhD with all the resources she needed. Dr. Madhombiro continues to shine! In a related development Dr. Madhombiro was awarded the best Post-Doctoral Presentation at Rochester University in the United States of America USA on 1 December 2018. His Post-doctoral topic was titled, “Assessing factors that influence antiretroviral treatment in Young adults in Zimbabwe.” Dr. Madhombiro attributes his success to hard work and determination.